Version 3.6.1 has just been released. While it's designated as a minor release, it introduces so many changes that it could've been a major version. 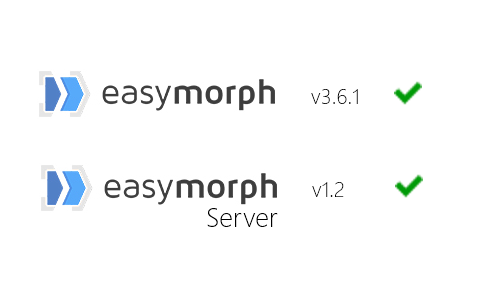 The release is synchronized with the release of EasyMorph Server v1.2 as they both share the same in-memory engine. 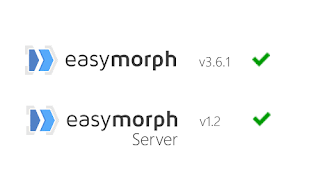 Previously the minimum version of .NET required for EasyMorph was 4.5. Starting from this release it's 4.5.1. The change won't affect the vast majority of EasyMorph users because the 4.5.1 was installed on their computers years ago with one of Windows system updates. For those who for some mysterious reasons missed it here is the link to .NET 4.5.1 installer. We've rewritten the parser for loading text files and now it supports quoted line breaks -- a long awaited feature that allows EasyMorph read correctly some files that it couldn't read previously, and comply with the RFC 4180 standard. However, it also means that EasyMorph may now import some text files differently, because now it imports them correctly. To help detect files that can now be imported differently, we included with the installer a command line utility that parses given text file(s) using the old parser and the new parser. If the parsers produce different results it prints a warning. The utility supports wildcards, so you can test with it multiple files at once. Previously timestamps (i.e. dates with time part) were exported into Tableau as only dates, without the time part. This required implementing a workaround such as exporting the time part as text in a separate column, and then appending it back to dates in Tableau using expressions. 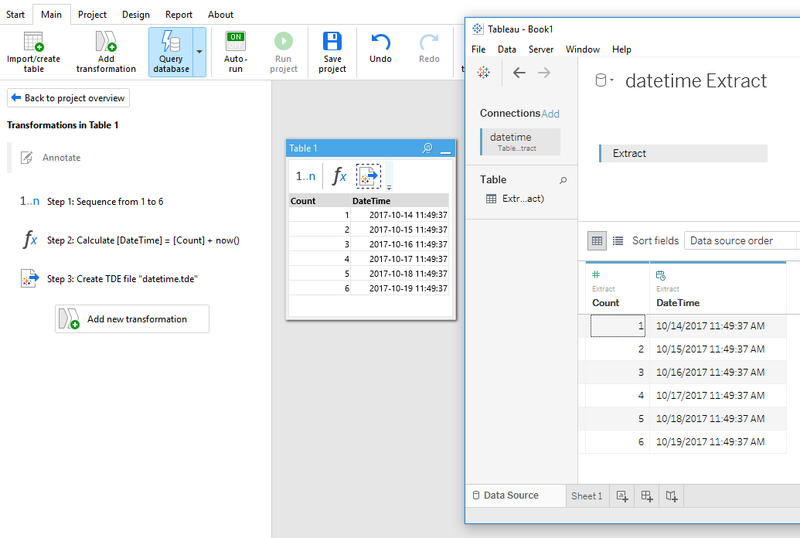 Starting from this release, if a column contains at least 1 date with time and has type “Date” in the “Export to Tableau” transformation then its Tableau data type set to DATETIME and its values are exported as timestamps. Similarly, numbers previously were always exported as floats. 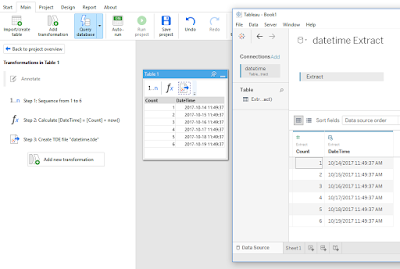 Starting from this release, if a column contains only integer numbers its Tableau data type is set to INTEGER and all its values are exported as integers. If the column has at least 1 non-integer value, or value that is outside of the integer range, then entire column is exported as floats. Integers and timestamps exported to Tableau (click to zoom). Another long-needed feature is the ability to append data to existing text files in the "Export to delimited text file" transformation. Now it can be used for various kinds of logging. For instance, for collecting records that didn't pass data quality checks. In the Append mode a text file will be created automatically if it didn't exist. 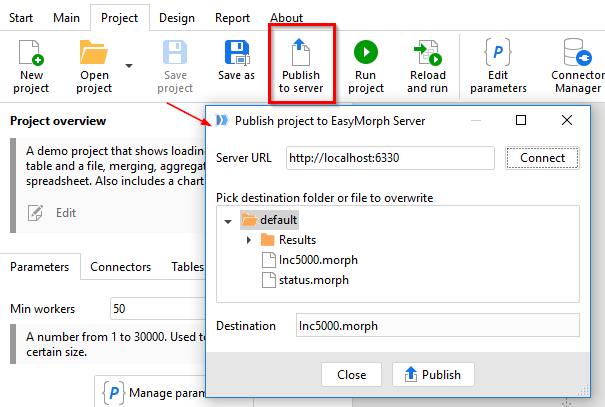 All desktop versions of EasyMorph now can publish projects directly to EasyMorph Server v1.2 and up. 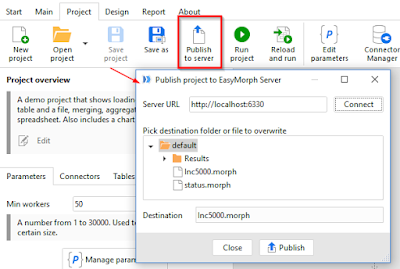 New button “Publish to server” has been added to the Project menu. Publishing to EasyMorph Server (click to zoom). Now it is possible to insert comments in expressions. Start a comment with a double-slash (//). Everything between the double-slash and the end of line will be considered a comment and ignored during expression evaluation. A comment can’t span across multiple rows. Date literals and comments in expressions.